Are you struggling to keep up with the demands of your Twitter schedule? New tweets, what images you should use, responding to your followers, mentions and retweets… There’s got to be an easier way. It’s easy to be overwhelmed by social media. 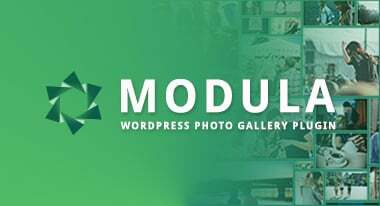 There’re so many platforms that you need to master as a blogger or a business owner. Twitter is one that many entrepreneurs would prefer to “set and forget” or avoid altogether. But Twitter is not a platform to ignore. Twitter has over 300 million active monthly users, sending 500 million tweets per day. And a study in 2014 showed that 54% of Twitter users have taken action after seeing a brand name mentioned on Twitter by either visiting their website, searching for them, or retweeting their content. 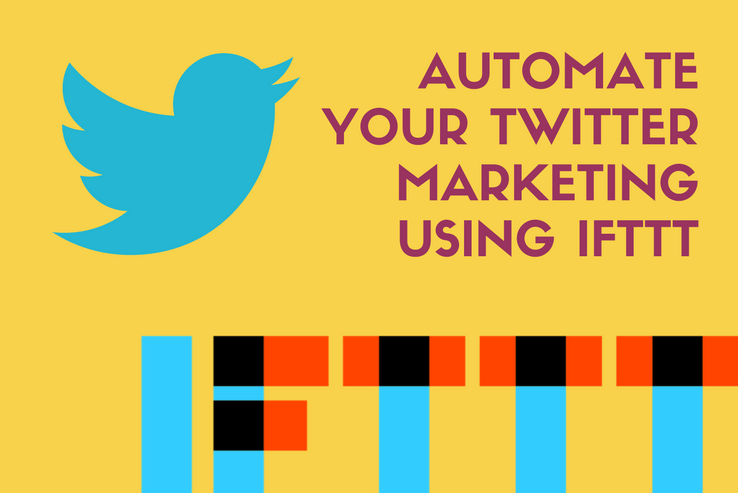 Using IFTTT, you can take the stress out of your Twitter marketing through automation. IFTTT is a useful automation tool that allows you to create “applets.” These applets link different tools and apps together based on triggers and actions. If THIS happens, then THAT happens. 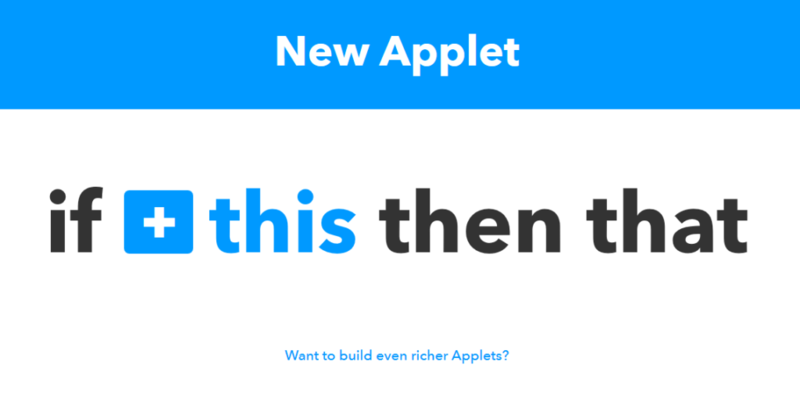 IFTTT has a range of over 400 apps you can create applets with. You can pair different apps or have your trigger app be the same as your action app. For example, Twitter is one app that you can use as both a trigger app and an action app. You could use Twitter as the trigger app and Facebook as the action app and have your tweets automatically post to Facebook. Or you could use Facebook as the trigger app and Twitter as the action app and automatically tweet out your Facebook status updates. How does this work for Twitter marketing? Promote your blog post when you publish it. Tweet your own content on a recurring schedule. Tweet other people’s content on a schedule. Networking and social engagement – replying, following, and liking tweets. Can IFTTT automate all these things? In a word, no. And you wouldn’t want it to. Real social engagement is impossible to automate, and IFTTT doesn’t allow you to follow, reply, or like tweets. That means you’ll need to follow, reply, like, and participate in Twitter Chats manually. The first thing you need to do is sign up for a free IFTTT account. The first time you try to use an app to create an applet, IFTTT will request permission to access it. 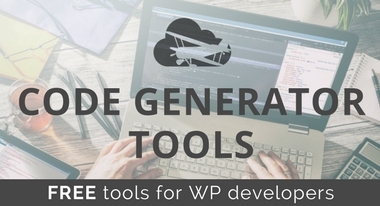 Simply follow the prompts to login and grant IFTTT access. If you’re prone to forgetting to tweet about your new blog post when you publish it, this applet is for you. Once you publish your new blog post, it appears in your feed and IFTTT will then tweet it. Set this applet up once and all your future blog posts will be automatically tweeted when you publish them. From the IFTTT home page click My Applets and then New Applet. Click This and select the Feed. You have two trigger options to choose from. 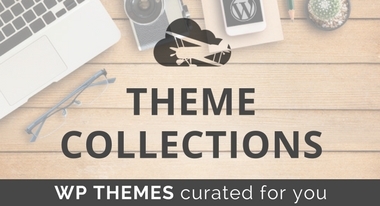 Choose New Feed Item to perform the action on every new blog post you publish. Enter your Feed link and click Create Trigger. 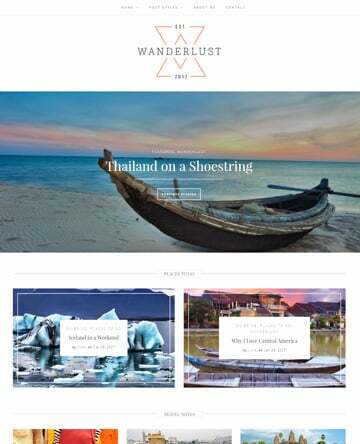 Note that this will often “yourwebsite.com/feed.” If you’re having trouble locating your feed this post may help. Now click That and select Twitter. Choose Post a Tweet or Post a Tweet with Image. By default, IFTTT will automatically pick up the title and featured image of your post from your feed. If you want to add more text, you can do that here. 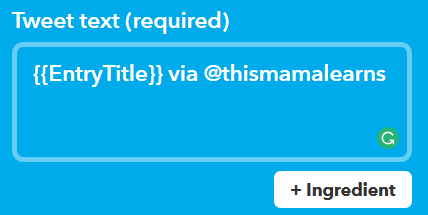 IFTTT will give you a summary of your applet and give you the option to be notified when the applet runs. You can turn applets on or off by clicking on them and toggling the on/off switch. Now, whenever you publish a new blog post, it will be automatically pushed to Twitter. But, what if you wanted your tweets to be a little more clever than just your blog post title? Read on! This is where the magic happens. Using IFTTT you can link a Google Calendar to your Twitter account, creating your own (free) version of those fancy social media schedulers that you might otherwise have to pay for. Setting up your Twitter schedule is as easy as creating an event in your calendar. And you can also set them to recur to easily recycle your content. Head to My Applets > New Applet. Click This and select Google Calendar. Choose Event from Search Starts as your trigger. 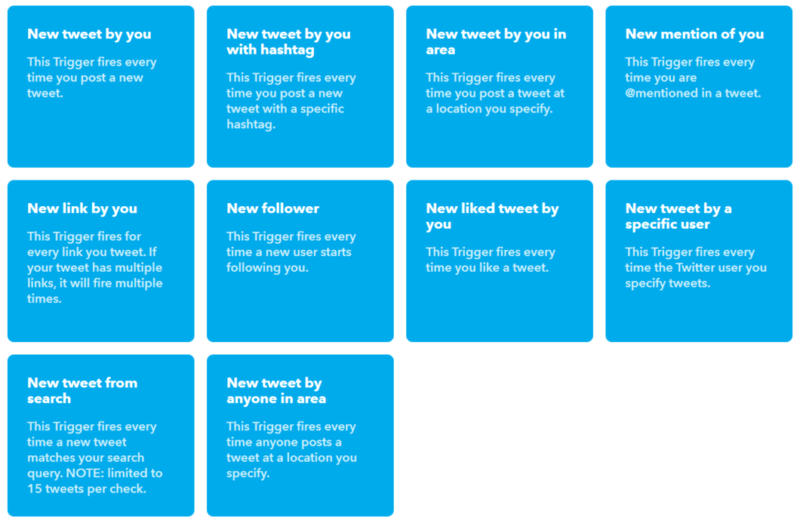 This way you’ll be able to add a prefix or a hashtag to your tweets to get them to trigger. Enter in your Keyphrase, for example, “#twitter”. Now click That and choose Twitter. Select Post a Tweet With Image. Click Ingredient and change the Tweet Text from Title to Description. Your event title is going to be for your reference only, and what you actually want to write in the tweet can go in the Event Description of your Google Calendar Event. 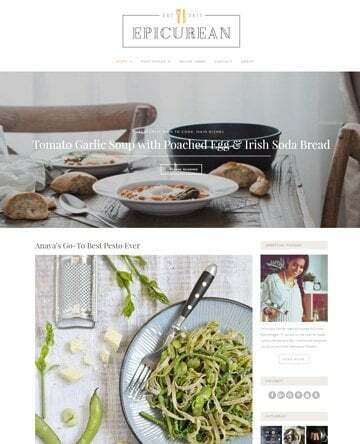 Click Ingredient and add Where to Image URL. 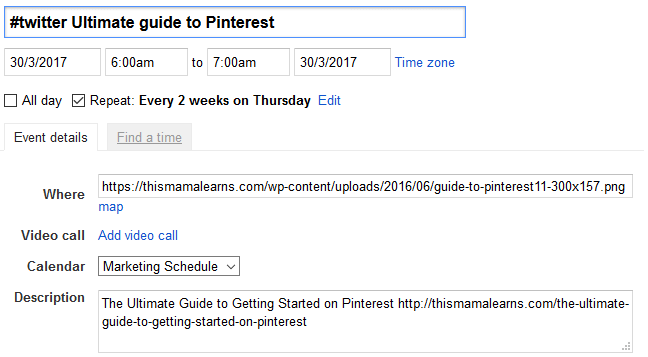 Now you can add the URL of your blog post’s featured image into the Where field on your Google Calendar Event and it will appear in your tweet. Now, to schedule a tweet, you simply create an event on your Google Calendar with the title #twitter. In event description, add what you want your tweet to say. And in location/where, add the URL of your image. This applet is perfect for scheduling multiple tweets for each of your new blog posts. It also works well for recycling your content. It’s easy to repeat events using Google Calendar. One of the hardest things about keeping up with a social media schedule is curating enough new quality content to fill your schedule. 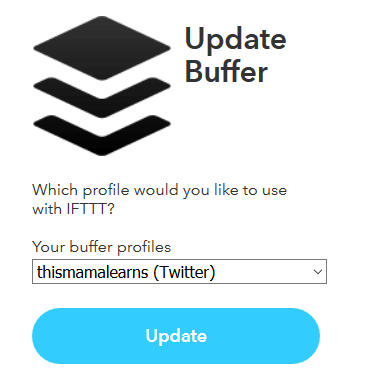 With IFTTT, you can set up an applet that will automatically add new content from your favorite blogger’s feed to your Buffer queue (or you can bypass Buffer and tweet it straight away). Why use Buffer? If you’re already using it to curate content, IFTTT can help bulk up your queue so you don’t have to manually find as much content. It also helps to make your tweet look a little more natural, rather than tweeting immediately after the blogger hits publish! Click on This, and select Feed. Choose New Feed Item, or, if you’re only interested in tweeting about certain post types, choose New Feed Item Matches. Add the RSS feed of your favorite blog, and if you chose New Feed Item Matches, add the keyword or phrase. For example, if you were a Pinterest Marketing expert, you might want to tweet everything a respected site like Social Media Examiner publishes about Pinterest. But you might not be as interested in their posts about Facebook Live. Now click That and select Buffer. 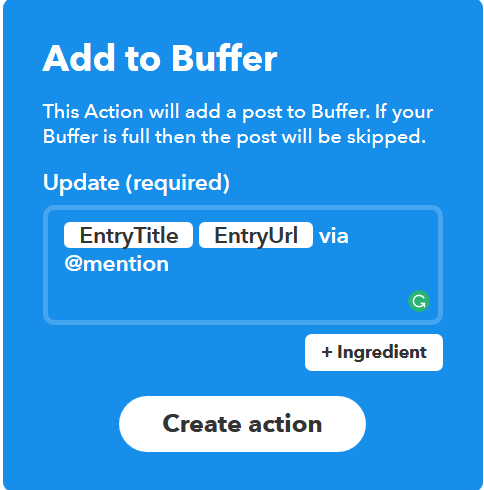 You’ll need to Connect and authorize IFTTT to access your Buffer account. Select your Twitter Profile from the drop down menu. Choose Add to Buffer Queue. You can change the Ingredients and add more information to your tweet. If you want to @mention the blogger or blog owner, add an @mention here. Can I Use IFTTT to Respond/Follow/Like Tweets? IFTTT won’t let you follow users or like tweets automatically. However, you can automate some responses. For example, you can automate a “Thanks for the Mention” tweet that triggers whenever someone mentions you or a “Thanks for the follow” tweet whenever someone follows you. Click on This, and select Twitter. Choose New Mention of You or New Follower. For new followers, IFTTT will default to “FULLNAME is now following me on Twitter! 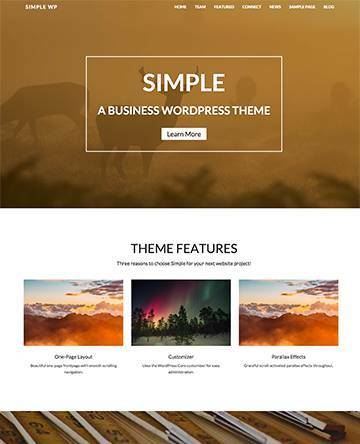 LINKTOPROFILE”. 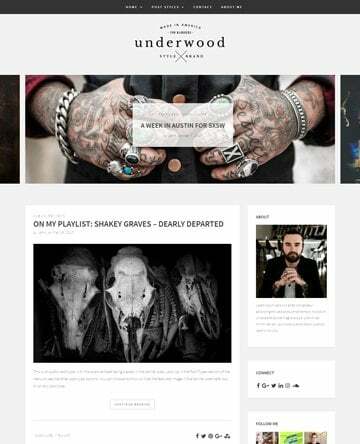 You can change this to suit your own brand style. For example, instead of sharing their Twitter Profile link, you might want to share their website URL instead. There are several different Ingredients you can experiment with. For new mention, IFTTT defaults to “Thanks for the mention! 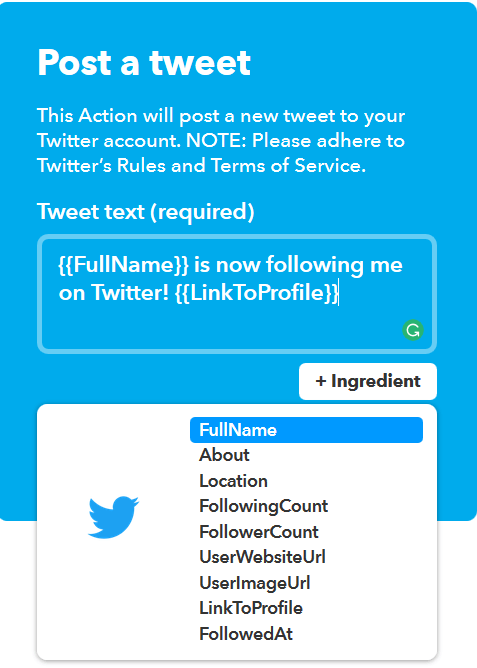 USERNAME:TEXT” You can swap out the Ingredients to include a link to the tweet or the Tweet Embed code if you want to try something different. Twitter is a platform many just want to “set and forget.” While you can’t automate everything, you can make Twitter much easier with IFTTT. Using IFTTT you can automatically tweet about your new posts, schedule tweets from your Google Calendar, and automatically tweet the latest posts from your favorite sources. You can also set up tweets to thank your new followers and to thank people for mentioning you. Over to you – how do you use Twitter for your blog or business? Do you use any automation? Amazing article. I find it on Upflow. 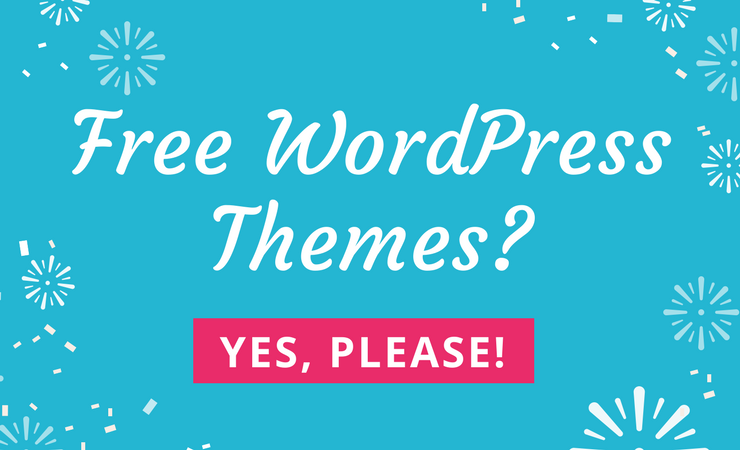 I am also planning an IFTTT post, but you have a better understanding of it than I do. Thank you for your kind words, Janice 🙂 I’m glad you liked the article and I hope it gives you some ideas to get IFTTT working for you. It saves me a lot of time each week! Wow thanks for sharing this. i have been using ifttt for a while now but i never knew i could shedule tweets using google calender applet. this article is surely an eye opener. I’m glad you enjoyed the post, Jay! It’s such a brilliant feature 😀 Makes it so easy to set up your twitter schedule.